Pulire una stanza artigianale è sempre un compito immane, ma la cosa buona di farlo è che di solito trovi cose che avevi dimenticato di avere. Ho davvero bisogno di fare lo stesso, ma il tempo ha sempre la meglio su di me. La tua carta è così bella e che idea meravigliosa usare l'involucro di cioccolato, un ottimo riciclaggio e così efficace. Fabulous way to recycle and the snowflakes look amazing! 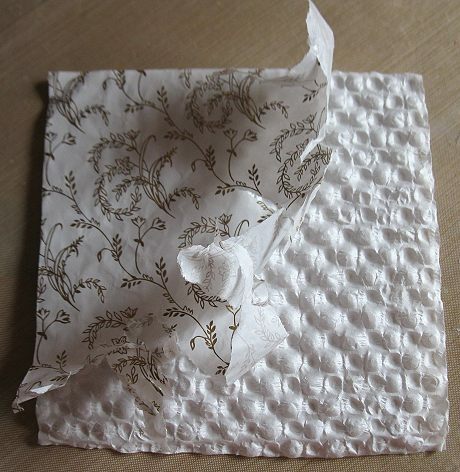 The wrapping from the chocolate box has an interesting texture, good idea to take advantage of it for your simple and stylish Christmas design. Sei incredibile! Bella e l'effetto è forse meglio di una cartella da embossing! what an excellent use of re-cycled pacakaging. This makes your design look so effective and pretty. Love the gold touches to go with it too. The texture of your snowflakes looks fabulous! What a great way to use the packaging Alice. 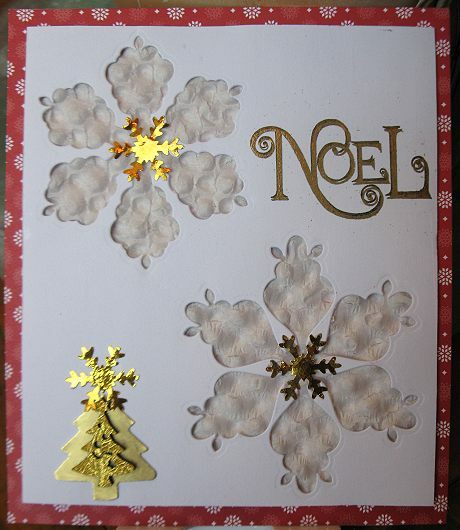 The addition of the gold snowflakes and double tree again using chocolate packaging (I would definitely be craving chocolates by now :D ) is a wonderful way to embellish the card. Oh, that is so smart - snowflakes from the biscuit box liner! They are so pretty and such a cool texture. 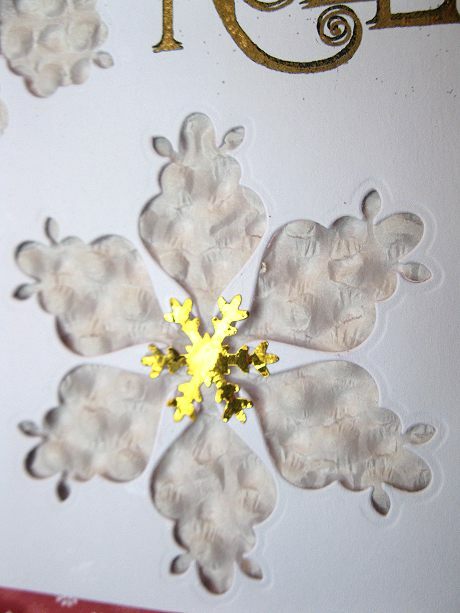 The gold snowflakes are a perfect embellishment. Good luck getting your craft room organized - and then will you come do mine? A beautiful card, such a fabulous idea. I always get half way through sorting out my craft room and wish that I hadn't started! You have done a fabulous job upcycling your chocolate packaging. I am so impressed with your ideas. Those flower/snowflakes look so pretty and the texture is fabulous. Great card...and thanks for taking part in the August Rudolph Days Challenge. 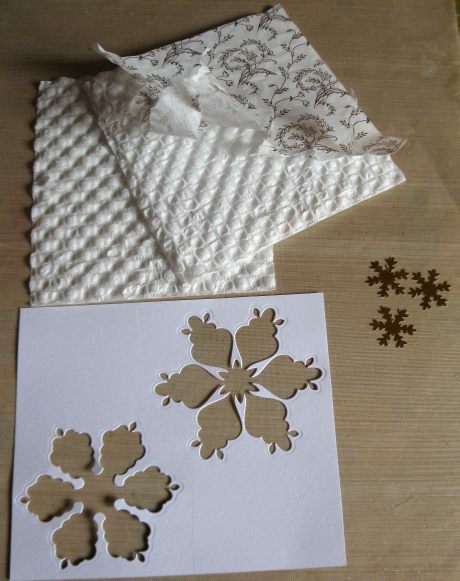 What a great idea, your up-cycling has made the most beautiful snowflakes. Bellissima carta, Alice. Mi piace l' oro!!!!!!!! Baci, amica. Che idea geniale di riciclo creativo!!! E che effetto!!! Super complimenti! 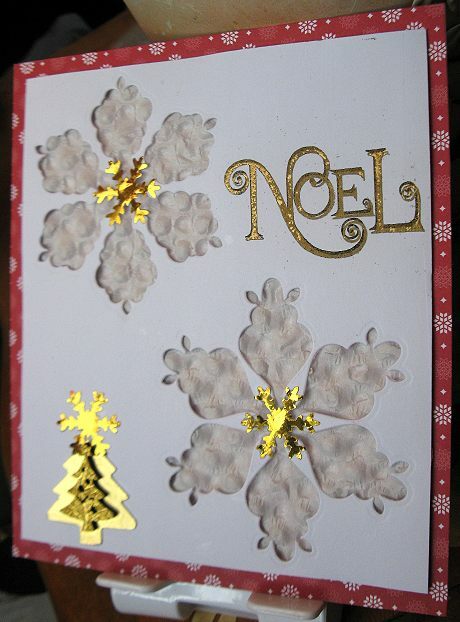 Thank you soo much for taking part in our "anything goes with optional no square or rectangle card” challenge over at Creatalicious & good luck in the draw.